It’s Friday night. You would think that the minuscule town of Bra would stay at home for a night in. However, you would be mistaken. It’s called aperitivo, and it is my new mistress. This isn’t your average happy hour or after-work drink with friends. Like all things Italian, it’s dramatic and deliciously over the top. For a few Euros, you’re given an endless supply of focaccia bread pizza, olives of all denominations, a cornucopia of cheese slices, salumi, prosciutto, breads, grissini (breadsticks) and other tid bits. Think of it as the opposite of happy hour–where the drinks are cheap and the food is expensive. Wine here isn’t exactly going to cost you an arm and a leg–you can get a pretty decent red for about $4 in the restaurant (and about the same per bottle in the super market). It’s just that the wine happens to cost more than this lavish spread of all things delicious. On top of that, the cozy cafes around every corner have in-house DJs spinning the latest tracks. Suddenly the waiter becomes the DJ, barista, host and sommelier all at once. Music blasting (in some places), “chin chin”(cheers) on everyone’s lips and the taste of something savory on their tongues, Bra comes alive at night. This town continues to surprise me, so I wanted to one-up it. Here’s an aperitivo you can recreate at your home. 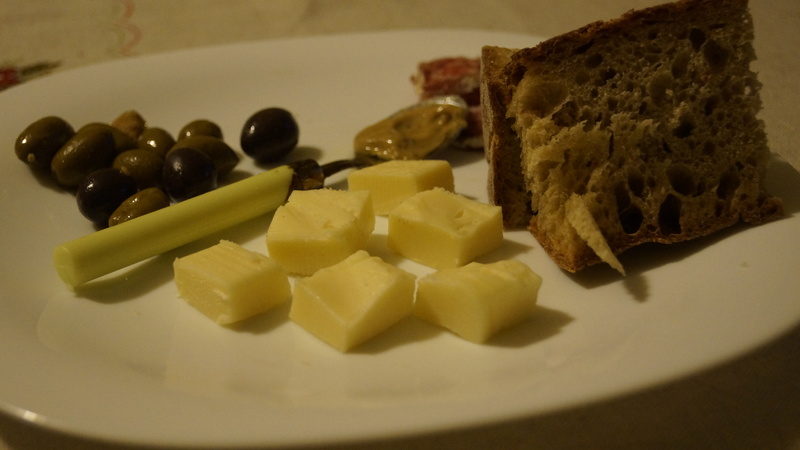 I have mixed olives (Kalamata and green), truffle infused salami, porcini mushroom cream, Calabrese bread and a semi-soft cow’s milk cheese. Pair with wine and good company. Chin chin!